Four Police Chiefs and a Lieutenant Deliver Meals on Wheels. (above, l-r) Chief Anthony Buccelli of New Providence, Chief John Cook of Springfield, Lieutenant Joseph Giannuzzi of Mountainside, Chief Robert Weck of Summit and Chief John DiPasquale of Berkeley Heights. Across the nation during the month of March, local officials took part in the Meals on Wheels America campaign to raise awareness for isolation and poor nutrition among older Americans. 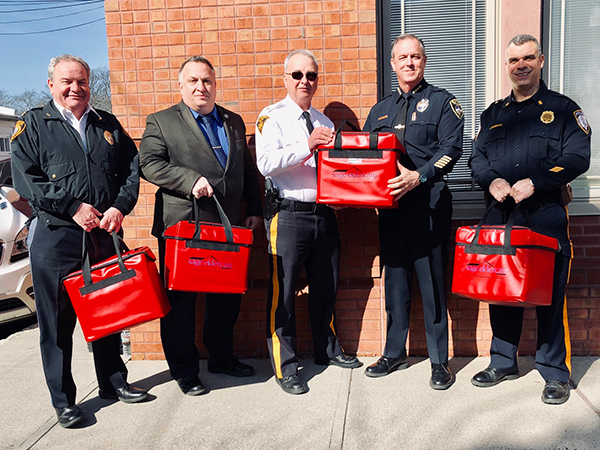 Four Police Chiefs and one Lieutenant gathered together at SAGE Eldercare on Wednesday, March 13, 2019 to deliver meals to residents in their respective towns.